Our vision is to be a Church where transformation occurs through worship, discipleship, fellowship, ministry, and evangelism. Our mission is to Make a Difference for the Kingdom of God through the transformation of lives through worship, discipleship, fellowship, ministry, and evangelism. A few years prior to 1872, Mr. Daniel Porter organized a mission Sunday School in his home on the corner of Walnut and Selden streets. The Sunday School later moved to the home of Mr. Hamilton Garnett on Ragland Street, west of Walnut Street. It was there that Mount Tabor Baptist Church was organized, with Mr. and Mrs. Daniel Bates, Mr. and Mrs. L. D. Anderson, Mr. and Mrs. Hailstake, Mr. and Mrs. Harrison Carter, and a few others. In 1872, Rev. C. C. Faggins was elected Pastor and served 14 years. Some years later, the church was given a parcel of land at Cedar and Selden Streets. The members pooled their resources, talents ingenuity and worked together in designing and building their first small church, which was 30 x 40 feet. Under Rev. Faggins’ leadership, the church prospered, and its program expanded. His influence in the community was highly respected and recognized. Upon the passing of Rev. Faggins, the pastorate of the church passed on to the Rev. H. Mayo, who served five years (1886-1891). His leadership emphasized physical and spiritual improvements within the church. At the turn of the century, the leadership was transferred to Rev. J. T. Turner, who served as pastor for ten years. He devoted his time largely to the tasks of bettering the moral and material conditions of his flock. After the leadership of Rev. Turner, Rev. Richard J. Bass became pastor and served 25 years. During his administration, many members were added to the church. He was deeply interested in the younger members and took delight in instructing them in religious activities. Rev. William H. Skipwith, often referred to as “The Singing Evangelist”, served as the pastor of the church for five years. With his direction, extensive renovation was accomplished, and many members continued to be added to the church roll. Upon the resignation of Rev. Skipwith, the leadership of the church was passed to Dr. Cary S. McCall, who was nominated by the Pulpit Committee. Rev. McCall embarked upon his ministry at the church on April 5, 1933. With the Housing and Re-Development Program for the City of Richmond in action, the old Mt. Tabor Church and land on the corner of Cedar and Selden Streets were purchased to make way for a Housing Project. From June 30 to December 29, 1957, services were held in the Woodville Elementary School. The congregation moved into its present church building on January 1, 1958. Our current edifice was comparatively new, constructed between the years of 1947 and 1948 by Fairmount Memorial Baptist Church. In 1967, the mortgage was burned. Truly, the Lord has smiled upon us. Dr. McCall was a Richmond institution. He was called “The Dean”, “The Bridgebuilder”, and “Friend”. In June 1987, Rev. Dr. Cary S. McCall retired and became our Pastor Emeritus. Dr. McCall had served his congregation unselfishly and humbly for 54 years. He became the first minister to remain at one church for that length of time in the Commonwealth of Virginia. Dr. and Mrs. McCall will always be cherished at Mount Tabor for their devoted service. Although the pulpit was temporarily declared vacant upon Dr. McCall’s retirement, the congregation firmly believed that our Almighty Father would send a shepherd to lead His flock. The leadership of Mount Tabor Baptist was passed to Rev. Dr. Charles E. Jones in December of 1988. 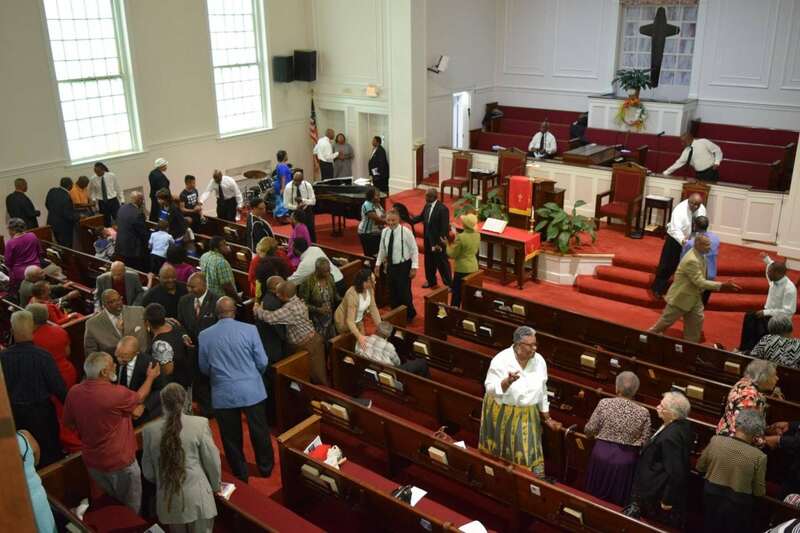 Under his leadership, the membership, and the overall attendance in worship services and evangelistic efforts in the Church Hill community increased. He established the Future Fund for church renovations and additions; established the Children’s Ministry, and organized the Summer Day Camp Academy. He was instrumental in bringing the Church Hill Cooperative Baptist Ministry to Mount Tabor. Dr. C. E. Jones’ emphasis was to uplift the church. He constantly praised the church and church officers for the progress made. His concern for the upkeep of our church building led to the renovation of our roof, the restoration of our Hammond organ, and the Restoration-Renovation Project to update church facilities in preparation for future ministries. Dr. Jones penned our present motto, also: “Spiritually Redemptive, Educationally Respectable and Socially Responsible”. After a brief illness, the five-year pastorate of Dr. Charles Jones ended on June 3, 1993 with his untimely demise. From June 3, 1993 to May 13, 1994, our church was under the leadership of our Assistant Pastor, Rev. Herbert L. Ponder. Rev. Ponder carried the church forward, continuing the emphasis of Mount Tabor’s role in the community, the youth, and the family needs of our neighborhood. We ventured into a program with Whitcomb Elementary School called “Walk to Win”. Weekly, members of Mount Tabor would walk in a school to show the children how good God is, and how, through Him, we all can be better citizens. On May 14, 1994, Rev. Dr. Herbert L. Ponder was elected Pastor of Mount Tabor Baptist Church. Under Dr. Ponder’s leadership, the church has continued its spiritual and physical growth. Dr. Ponder’s pastorate has emphasized the importance of Christian education and discipleship in the spiritual and physical growth of our membership. As a result, Mount Tabor has become a seven-day church, with various Bible study and fellowship opportunities. In striving to be Spiritually Redemptive, Educationally Respectable and Socially Responsible we have reached outside the walls to reach our community for the Lord. We have held several community oriented evangelistic events, health expos, church picnics, and community prayer walks to celebrate with the community. In August 2016, Mount Tabor Baptist Church planted a church in New York City by the name of Anointed Grace Ministries under the leadership of Rev. Henry McLauren. Missionaries have been represented in Detroit, Romania, Ghana, and North Dakota just to name a few places. With the Word of God as our guide, it is our desire to continue to Make A Difference in the Community for the Kingdom of God. The history of Mount Tabor Baptist Church reveals interesting facts about the physical growth of the church, while depicting a colorful trail over which the brave and determined forbearers of our present church generation traveled many years ago. With reverence for the past, faith in the present and hope for the future, Mount Tabor Baptist Church is moving toward new ministry challenges, building upon the foundation of Jesus Christ. We will continue to dedicate our lives to service, perpetuating Christian principles of love, peace and truth in God. We thank God for this great church and we pray that the future will become even greater in spiritual uplift and outreach. Our mission is to Make a Difference for the Kingdom of God through the transformation of lives through worship, discipleship, fellowship, ministry and evangelism. Our vision is to be a Church where transformation occurs through worship, discipleship, fellowship, ministry and evangelism. If you have any questions regarding Mount Tabor Baptist Church or our vision, history, or mission, we invite you to contact us at 804-643-0903 today. Learn more about our vision, history, and mission for Mount Tabor Baptist Church, dedicated to making a difference for the kingdom of God by transforming the lives of our members through worship, discipleship, fellowship, ministry, and evangelism throughout Richmond, Montrose, Highland Springs, East Highland Park, Mechanicsville, Lakeside, Sandston, Bon Air, and beyond.